Ohhhh mama, how I love you so, for making this. 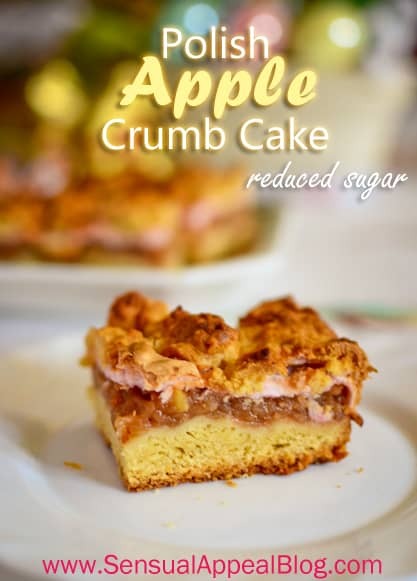 This Apple Crumb Cake appeared on our Easter table alongside the Poppy Seed Apple Cake. Both were amazing, both totally different. I couldn’t even tell that the Poppy Seed cake contained apples at first, whereas this one has a prominent apple flavor – clearly, since it has a delicious apple filling. 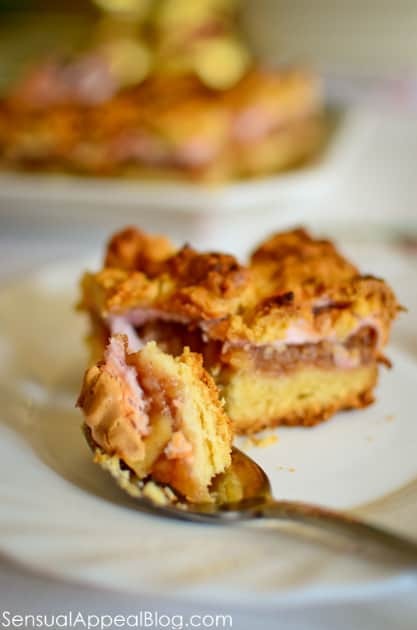 It was prepared similarly to how we prepared the filling for our Traditional Polish Apple Pie and it was soo good but still with no sugar added! It was the perfect combination of sweet and tart, it was truly ideal! Kissel (kisiel) is a fruit soup, popular as a dessert. It consists of sweetened juice, thickened with arrowroot, cornstarch or potato starch, and sometimes red wine or fresh or dried fruits are added. That’s the traditional preparation of kisiel. Before it becomes a “soup”, it’s a powder in a package. The purpose of it here is to add a thin pink foamy layer to the cake. You can see it on the photos, it’s right above the apple filling layer. You can’t really taste it and the only purpose kisiel serves as an ingredient in this recipe is that it is red and it is a thickener. You can experiment with your own version by adding a bit of thickener of choice, like potato or corn starch, and a bit of red coloring. I have not tried it with this way but my mom says it should work. Have you ever heard of kisiel? Do you ever get in a “funk” of using one certain main ingredient in baking/cooking over and over again, like my mom has with apples? Working on fixing the comments. Stay tuned! Quinoa flakes, that’s awesome. Do you mind sending me some good recipe links that use quinoa flakes? I bought a package like half a year ago and still haven’t used them. Well, I used them once in strawberry kiwi muffins last year but that’s about it, I need more inspiration! How do you like yours the most?? Oh yeahh!! I actually have them pinned but I haven’t had a chance to try them yet. Thank you for the reminder! This sounds and looks amazing! I have never heard of kisiel and after reading the description am still not sure what it is. I guess I just need to see it or use it in a recipe to understand. My whole menu is one big funk! LOL! I don’t think one can ever have too many apple cakes! Love all the layers of this! Mmm! I’m totally drooling over that apple filling!